The ASUS Eee PC 1015PEM is your stylish on-the-go companion for all-day computing. It allows you to access cloud computing anywhere with the light and compact Eee PC Seashell 1015 series. Add to that a contrasting play on light and shadows, and a variety of colors; the 1015PEM has come into its own indeed. The 1015PEM is the backpacker's companion, accompanying you to adventures in foreign lands. And with cloud computing access, you'll be able to access your movie or music files online, or surf the net to update your blog to tell the world of your travels. 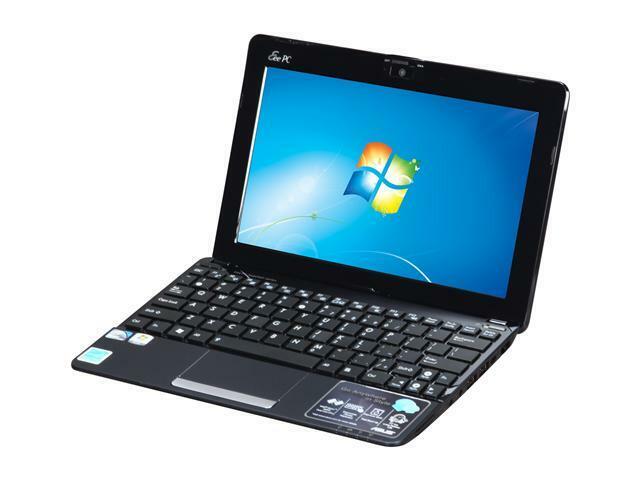 Go anywhere in style with ASUS Eee PC 1015PEM. Faster than Ever Before – Atom N550 Dual Core Processor The Eee PC 1015PEM marks a radical departure from other netbooks that usually feature single core Atom processors. With its Intel Atom N550 dual core processor, the Eee PC 1015PEM will set new netbook performance benchmarks. More importantly, this Dual Core Processor shatters today's netbook conventions by delivering a rich performance experience. Designed to Keep You on the Move With a design ethos that stems from the thin and light Eee PC tradition, the Eee PC Seashell 1015PEM has taken it a step further, featuring more rounded curves to give it a more streamlined shape. Ideal for the traveler, the Eee PC Seashell 1015PEM's light and compact weight means that it will easily fit into your hand luggage. The 1015PEM ensures you won't be bored while on transit at the airport. Ergonomically Designed for You The Eee PC Seashell 1015PEM boasts a streamlined and aerodynamic design with strongly defined contours. ASUS' approach to material innovation means that your 1015PEM will be available with a smooth matte or high gloss coating. It features an ergonomically designed chiclet keyboard and a 10.1"LED backlit WSVGA screen (1024x600) to ensure user comfort even after prolonged use. Imagine, Access, and Do More with ASUS' Cloud Computing Service Every Eee PC 1015PEM comes with the ASUS-exclusive Eee Docking platform that serves as a convenient, one-stop solution that grants you easy access to digital content, services, and other useful software. Saves Power and the Planet - 10 hours battery life with Super Hybrid Engine The Eee PC Seashell 1015PEM answers consumers' needs for a netbook that boasts a stylish design with a long battery life. The 1015PEM has a 10 hour battery life thanks to the ASUS-exclusive Super Hybrid Engine technology. The SHE intelligently adapts and adjusts power settings to give you the CPU performance you need. Based on the user settings and the applications being run, the SHE tailors the appropriate power requirements for the task at hand to ensure maximum efficiency. High Speed, Efficient Connectivity Speed and efficiency in a stylish mobile platform, your Eee PC 1015PEM is a perfect combination of beauty and performance. Also, the 1015PEM is capable of charging mobile phones via USB even when the Eee PC is switched off. The mobile phone can also draw power from the Eee PC’s battery. The 1015PEM’s built-in 0.3M Pixels webcam lets you videoconference with business associates a world away, while Gigabit Ethernet with up-to 1Gbps transfer rate and Wi-Fi 802.11n ensures that you’re well-connected even when you step out of the office. 10.31" x 7.01" x 0.93" - 1.43"
Comments: I RMA'd this and got a 1015PEM-PU17 instead and it has been perfect! I also own an Asus 1002ha and 1005ha and wasn't expecting a quality control issue coming from Asus!!! Comments: Expressgate is for all intents and purposes useless. Windows starter edition is equally bad with a swampload of 3rd party software, and runs much faster with a fresh install of ultimate. Installed ubuntu 11.04, and was much better equipped to handle the new ubuntu gui. Comments: After reading other reviews before purchasing, I bought and installed 2GB of RAM and it runs smoothly. I just purchased the Windows Anytime Upgrade: Windows 7 Starter to Windows 7 Home Premium (Starter can be a pain, the upgrade is worth it). I purchased this netbook so I wouldn't have to continue to lug around my 5-year-old 17" Dell laptop around on campus. I'm a graduate student and this netbook is perfect for taking notes in class, normal web-browsing, streaming music, Skyping, etc. Comments: For my purposes (traveling and accessing web-based applications) it's perfect. I upgraded to 2GB of RAM and Windows 7 Pro almost immediately, and so far its handled everything I've thrown at it including online classes, web-based applications, word, excel, skype, and so on, all while running security essentials in the background. The dual core is really invaluable for multitasking, and the price is definitely right. Comments: This is a really great net book. I did not buy it to game or do super advanced computing. I bought it to surf the net, stream the occasional television show, listen to music, do homework, take notes in class, and to work in Excel, Word and Power Point. I did quite a bit of research and found, for the price, this machine is far more stable and reliable than many of the full-sized laptops on the market across the price spectrum. I have a desktop computer, as well, so this is perfect for me. So far, it's really light (the laptop it is replacing weighs as much as one of my text books), it is fast, the keyboard has not been an issue, as it is only slightly smaller than my previous laptop's key board, and it has been a gem for doing online homework. It's great for school and travel, as it does not take much space on a desk or table, so it's not obtrusive.